We have heard time and time again that we are destroying the environment, and the truth is that our diets play an important part in this. Globally, agriculture represents about 25% of global greenhouse gas emissions (GHG). Relative to other major contributors such as the oil industry, the meat and dairy industry is expected to rise in terms of GHG emissions over the coming years. A study from Oxford University published in the journal, Science, estimated that on average, farmed animal products account for 58% of GHG from food production. These gases are of major concern as they are the primary cause of the global temperature rise. Meat and dairy farming release two greenhouse gases: methane and nitrous-oxide. As a result of breaking down grass, the microbes in a cow’s stomach produce methane. This potent gas can stay in the earth’s atmosphere for over 12 years, and, in that time, traps heat and warms the globe. Nitrous-oxide is another major GHG, produced from decomposing cow manure and from synthetic fertilisers, which are often applied to the maximise the growth rate of grass for dairy cows. Like methane, this gas also retains large amounts of heat and it remains in the atmosphere for 120 years. The problem with animal agriculture does not simply stop at harmful gas emissions. The Oxford study also found that farmed animal products contribute to 33% of freshwater withdrawals, 56% of air pollution, and 57% of water pollution. Additionally, the study found that agriculture is the leading cause of mass extinctions of wildlife, something which is evident in South American rainforests where widespread habitat destruction and fragmentation are driven by deforestation to create grazing land for livestock. The study, like many others, also showed that intensive animal farming is clearly a major source of environmental problems. In Ireland specifically, this reality is concerning, as the Irish food board estimates that around nine out of 10 people are meat-eaters. In Ireland, agriculture accounts for 33% of GHG emissions, compared to the European average of 10%. With these statistics, it is not hard to understand why Ireland has been ranked the worst country for climate action in all of Europe. Although these truths can be daunting, making a change in your diet can go a long way. 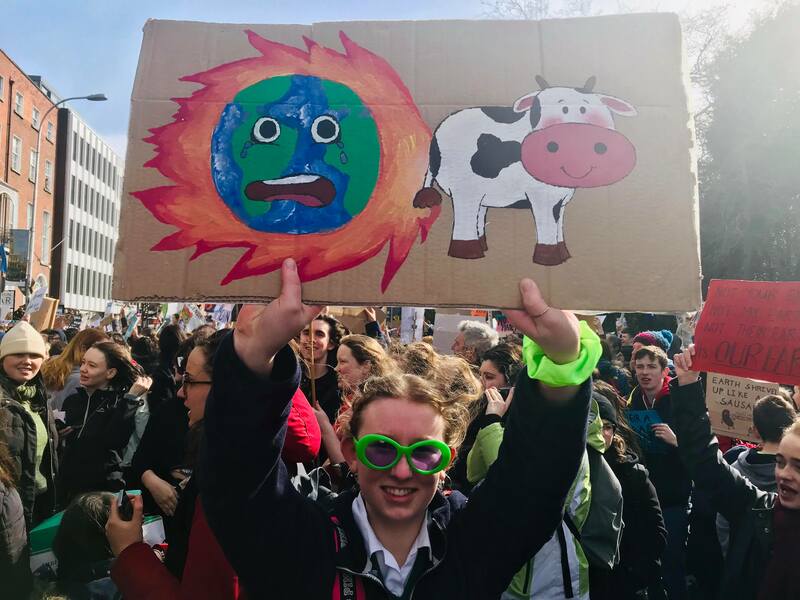 An overwhelming number of scientists across the globe agree that the single best thing you can do for the environment is reduce your meat and dairy consumption. It should be noted that a vegan diet produces the smallest amount of GHG and is generally considered the single biggest way to reduce your impact on planet Earth. The benefits would manifest themselves in the form of greenhouse gas reductions, as well as reductions in pollution, land use, and water use. This generation is especially privileged as it has never been so easy to transition to an environmentally friendly diet. A study investigating the demographics of dietary trends found that younger people were more likely to be vegetarian, and that women were more likely to be vegetarian than men. From a nutritional perspective, the same study found that compared to meat eaters, vegetarians showed a lower prevalence of certain micronutrient deficiencies, while vegans showed a higher prevalence of deficiencies for certain nutrients such as Vitamin B12. With a growing number of vegans and vegetarians, it is not surprising that options tailored towards these diets are on the rise. This is not only evident in an increased selection of products in the supermarkets but also in restaurants. In McGuinesses, Dublin has even found itself a late night chipper with an entirely vegan menu. It is easy to become overwhelmed with the realities this generation faces: increased temperatures, increased extinction rate, rising sea levels, frequent droughts, and the highest levels of carbon dioxide this earth has seen over the past 800,000 years. It’s even easier to brush off the facts and keep living your life regardless of the consequences. Every time we sit down for a meal, we are faced with a choice. If each person took a small personal step to reduce their consumption of animal products, we may be able to help the planet before it’s too late.